Optimal 1 Digestion Formula is a three-pronged approach to balancing your digestive system, combining enzymes, probiotics, and target-specific chelated minerals. Optimal 1 Digestion contains the full complement of enzymes needed to break down the typical American meal - but, unlike enzyme-only formulations, Optimal 1 includes the probiotics (or flora) necessary to help assimilate and absorb the nutrients and a unique delivery system to ensure that they are metabolized and used in the body. Optimal 1 also contains a specific mineral blend that peer review research shows increases the absorption of carbohydrates and protein by 50 percent. 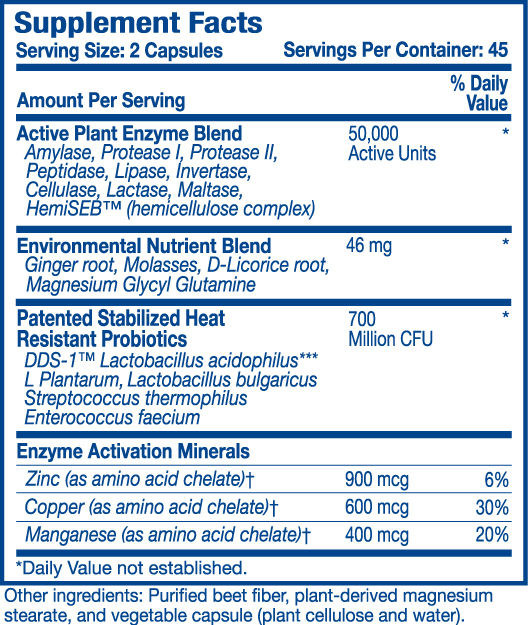 In addition, Optimal 1 effectively combats lactose intolerance by including the friendly bacteria that make lactase. The only complete formula for complete digestion. Indigestion can be distressful, annoying, even dangerous, especially when ignored or treated incorrectly. Antacids and acid blockers stop digestion, which only adds to the problem! Cooked and processed foods rob the body of enzymes and other nutrients needed for complete digestion and absorption. The body considers digestion a top priority. Other processes, including the immune system, energy production and even brain function, all wait while the body digests food. When digestion is functioning properly, food is broken down and nutrients are made available by the body itself for repair, metabolism, and healing without undue stress on the body. Unfortunately, the way our foods are grown and processed, toxins in the environment, and even stress, anger and many other factors wreak havoc on digestion. The result is that many Americans experience digestive problems, from ongoing symptoms of bloating and gas, to diarrhea, stomach cramps or the more severe digestive disorders. Most often, digestive problems are a sign of enzyme depletion. Enzymes are not only crucial to digestion; they are the catalysts that allow the body to breathe, reproduce, and generate energy. Nothing in the body works without enzymes. Life itself depends on enzymes. Yet, virtually every individual is deficient in these vital protein molecules. Stress, caffeine, alcohol and even extreme weather conditions all destroy enzymes. The most serious threat to our enzyme supply is cooked and processed foods. Raw foods contain enzymes that help break them down in the digestive system However, the cooked foods that make up the bulk of the modern diet are devoid of enzymes; so, the body must constantly draw from its limited supply of digestive enzymes. As this supply is depleted, in order to accomplish digestion, the body must rely on metabolic enzymes. When this occurs, other bodily processes are compromised, disease is more common and aging is more pronounced. Dr. Edward Howell, who spent over forty years studying the effects of enzymes on health said, "Humans eating an enzyme-less diet use up a tremendous amount of their enzyme potential in lavish secretions of the pancreas and other digestive organs. The result is shortened life span (65 years or less as compared with 100 years or more), illness and lowered resistance to stress of all types, psychological and environmental. Research proves that environmental stressors such as pollution, toxins from processed foods, and stress effect critical digestive hormones that are necessary for proper digestion. A fascinating feature of the digestive system is that it contains its own regulators. The major hormones that control the functions of the digestive system are produced and released by cells in the mucosa of the stomach and small intestine. These hormones are released into the blood of the digestive tract, travel back to the heart through the arteries, and return to the digestive system, where they stimulate digestive juices and cause organ movement. These hormones are damaged by environmental factors from pollution, processed foods and stress. The Optimal Digestion formula has followed the research that shows lifestyle stressors deplete the balance of these critical hormones and have added nutrients to support them for increased digestion. To help combat this damage so many of us face to the digestive system, there has been an Environmental Nutrient Blend added to Optimal 1 Digestion. This blend contains nutrients that are proven to help repair damage to the digestive system. The phenomenal blend contains specialized forms of ginger root, pine nut, licorice root, and magnesium glycyl glutamine in the proper amounts to balance these digestive hormones and complete the digestion of all your food intake. Each of these nutrients in specific amounts help balance and control gastrin, which causes the stomach to produce an acid for dissolving and digesting foods. It also is necessary for the normal growth of the lining of the stomach and colon. Secretin is another hormone that is balanced by the newly added nutrients. Secretin causes the pancreas to send out a digestive juice that is rich in bicarbonate. It stimulates the stomach to produce an enzyme to digest protein (pepsin). It also helps stimulate the liver, which is generally compromised by many stressors. The last hormone being overly bombarded by environmental stressors, which is addressed with the advanced Optimal Digestion formula, is CCK. CCK regulates the growth of the pancreas and production of pancreatic juice. Besides regulating these critical digestion hormones, the added nutrients also help with numerous other aspects of digestion. Ginger root-is one of the best herbs for digestion. It helps prevent indigestion and abdominal cramping. Ginger also helps break down proteins, aiding the digestion process. Licorice root-has been shown to support and promote healthy stomach lining and intestinal flora. Magnesium glycyl glutamine (stabilized)-re-writes the book on utilizing anabolic nitrogen molecules to help cleanse and fortify the digestive system. Optimal Digestion also includes probiotic strains that are proven to colonize in the intestines even at extreme acidity and high temperatures. These strains of flora are stabilized and can survive the harsh environment in the digestive system even with all the toxins bombarding us today. These special strains of flora DDS-1 and L. plantarum are proven to still be viable at well over 110F. This guarantees the flora can colonize in the intestines and aid in proper digestion. Even if you eat nutrient-rich foods, you can be feeling the effects of starvation! Your body may be starving for nutrients and you may be experiencing conditions like bloating, decreased energy, premature aging, lowered immune response, and even weight gain if your digestion is compromised and you are unable to break down your food to useable energy. The most effective digestive aid ever developed. Optimal 1 provides EVERY nutrient needed for digestion, including plant enzymes and minerals to break the food down into useable constituents and friendly bacteria to aid in assimilating those constituents into the bloodstream. As the research shows, you may well be starving yourself by eating enzyme-deficient cooked and processed foods. Fight back with Optimal 1- Digestion Formula and feel the benefits of Optimal Health today. Take Optimal 1 with each meal to ensure digestion an assimilation. . . and promote Optimal Health! I use this Formula with the Flora and it really works for me. Twice a day with meals and it helps with my stomach issues. My husband had an Ivor Lewis Esophagectromy because of esophageal cancer. His digestion system was really giving him havoc, and I want to say within the first few days after taking Optimal 1 Digestion everything has evened out. He hasn't the refluxive episode , I just want to thank you a lot for your product. Great product to help you absorb nutritive aspects of your deep. I was anemic as I was not absorbing iron from my food. Since taking Optimal One Digestion I have been healthier than ever.